While many of the traditional jobs (hunting, sledding, herding) that dogs once performed are becoming increasingly rare in modern society, dogs are definitely in no danger of becoming unemployed. Demand for dogs and their special skills just keeps skyrocketing, including assistance dogs working in partnership with the disabled, police and military dogs helping keep our streets and soldiers safe, and even dogs working in a medical capacity, to detect cancer and other conditions. 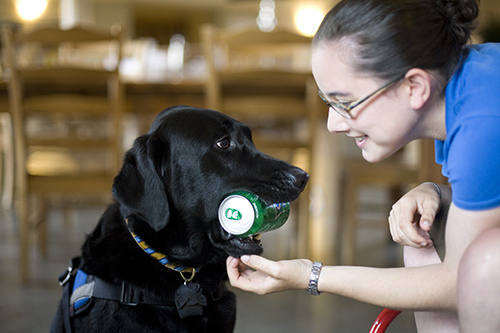 One of the most rapidly growing of these new canine careers is that of the service dog. Service dogs assist people who have disabilities, and are trained to retrieve items that are dropped or out of reach, opening and closing drawers and doors, turning light switches on and off, and many other tasks. People who are partnered with service dogs report that the companionship and social support their canine partners provide contribute as much to their sense of well being as the physical tasks the dogs perform. In the United States and many other countries, service dogs may accompany their partners everywhere. To do this successfully, service dogs need to feel comfortable in an almost limitless variety of surroundings, able to navigate everything from planes, buses and trains, to moving sidewalks, movie theaters, supermarkets, restaurants and shopping malls. Preparing a future service dog not only to succeed but also to flourish in its career is not a simple task. 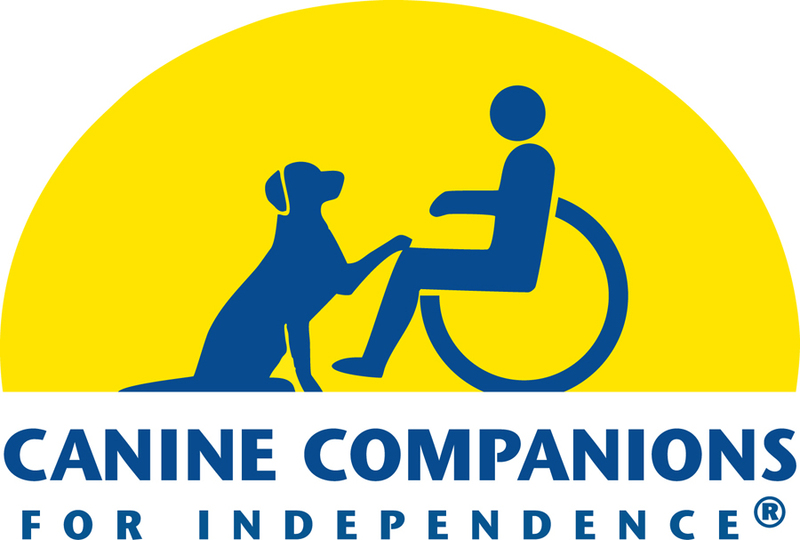 Canine Companions for Independence (CCI) has been dedicated to this effort since 1975. For us the task begins even before the puppy is born, selecting breeder dogs that demonstrate success in the early stages of service dog training. A new litter of Canine Companions. 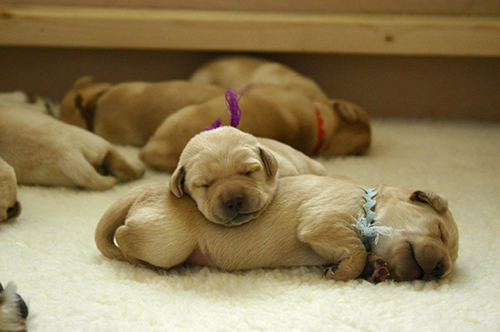 The different color yarn around each pup’s neck indicates birth order. Puppies are born and live in the home of a volunteer breeder caretaker for their first eight weeks and then for the next 18 months each puppy lives in the home of a volunteer puppy raiser. The potential service dog is nurtured and socialized, accompanying the puppy raiser to even more places as it gets older. Puppy raisers take their Canine Companions puppies to training classes and spend time teaching the pup appropriate manners, all carefully designed to provide a foundation for the service dog training each pup will later receive and to ensure that the pup is comfortable in any environment. At 18 months, foster families bring their dogs to one of Canine Companions five training centers for six months of professional service dog training. 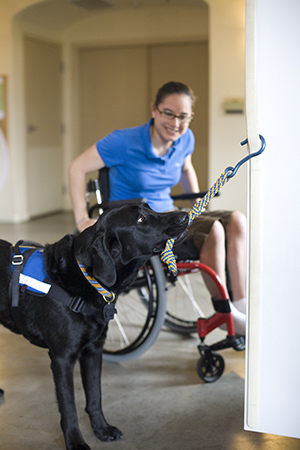 Dogs are taught more than 40 discrete behaviors that will eventually be used to assist someone with a disability. The culmination of training is a two-week Team Training class where the dogs are matched with their partners. It should come as no surprise to anyone reading this that both dogs and people have varied personalities, abilities and working styles, and for the long term happiness of both partners, we take pains to make the best match possible. At the conclusion of Team Training, dogs and people celebrate a graduation and return to their homes as part of a new team that will be working together for years to come. 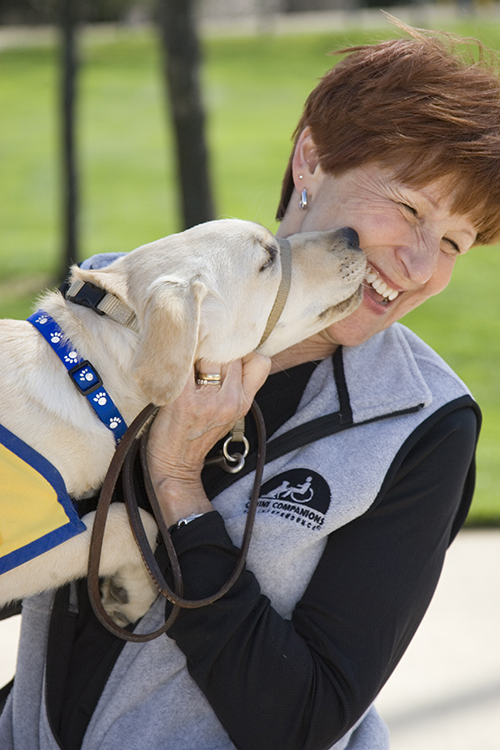 The owners and dogs involved in Dognition are poised to make a critical contribution to the success of Canine Companions programs. While each Dognition owner learns about his own dog, the aggregated findings help us to better understand the strategies that all dogs use to navigate the world. By applying these findings to the CCI puppy raiser program, we hope to be able to identify future generations of service dogs more readily, and place them into the amazing service roles that they are uniquely capable of playing. Posted in Dog Life. Tagged with Canine Companions for Independence, CCI, service dogs.